← Desde 2008, a fase mais difícil no Rio: estamos trocando de pele? power vacuums (in Rio, created by the demotion of drug traffickers whose territories are pacified), readily occupied by police, without sufficient training or policy considerations. A judge allowed a Pavão-Pavãozinho favela drug trafficker, Adauto “Pitbull”do Nascimento Gonçalves, to go home for a family visit and he never returned. This disturbed the tenuous peace in the pacified favela, part of which, aptly named “Vietnam”, slipped out of police control several months ago. The shift took place in the context of similar circumstances, with attacks on police and growing violence experienced by residents in other favelas. At the same time, lame-duck governor Sérgio Cabral stepped down to help his vice-governor, Luiz Fernando “Pezão” de Souza, make a name for himself in order to get elected this coming October. Rio’s public safety policy hinges on the outcome of the election. Favela residents have been demonstrating frequently in recent months, often in response to police violence. O Globo newspaper has reported that drug traffickers urge them on. Other factors, such as the examples of the June-July-August 2013 street demonstrations, the teachers’ strike and the trash collectors’ strike, may also contribute to a new willingness to “come down the hill”, block traffic and set trash, buses and other items on fire. Police performance has increasingly been criticized since last year, particularly after the death of laborer Amarildo, said to have died during a police torture session. Sociologist Ignacio Cano, who performed an evaluation of the police pacification program in 2012, believes that very few of his recommendations, including the institution of police protocols, were ever implemented. And so, the latest tragedy, in what will surely continue to be a string of horrific news for quite some time, arose yesterday morning in Copacabana, when the body of 26-year-old Douglas “DG” Rafael da Silva Pereira was found on the premises of a day care center up the hill, in Pavão-Pavãozinho. At least one other death ensued; at night, shots were fired, blasts were heard, the UPP offices were attacked, the lights went out in much of the favela. Douglas died, according to a medical examiner’s preliminary report, of a piercing object to the lung, most probably, according to one expert, a bullet. Today, the lights are back on and the noise has abated. Globo TV reported that intense shooting occurred this past Monday night, as police attempted to close in on “Pitbull”. That police action is under investigation. It could be that Douglas, who coincidentally, like another young man that died violently two years ago, danced on Regina Casé’s pioneering Sunday afternoon Esquenta! program, took a bullet in crossfire. According to his mother he was tortured by police and there is a witness. Though Douglas didn’t actually live in the favela (but nearby), he starred in a short movie that foreshadowed his premature death. In this complex scenario, the upcoming World Cup and Olympic Games have ratcheted up the stakes for everyone. And pacification, at the heart of Rio’s turnaround and the debate over increasing violence here? The issue that will most likely decide the election? The weaknesses outlined above are only part of a longstanding intricate power and social structure that needs to change radically if Brazil’s democracy is to last. It would be impossible to untangle that structure in one revolutionary go. For Rio, pacification, with its many defects, was a tentative first step in the right direction, helped along by rising real incomes, economic growth and greater access to university education, among other improvements. But the public safety policy dating to 2008 shook up all the players in Rio’s social structure and shone light on their warts. Now that we (and hundreds of foreign journalists covering the mega-events) can see them more clearly, what will we do about them? How fast or slowly can we keep on untangling –and redrawing — Brazil’s antiquated socio-economic structure? This entry was posted in Brazil, Transformation of Rio de Janeiro / Transformação do Rio de Janeiro and tagged Douglas DG, Esquenta dancer killed, pacification Rio de Janeiro, pavão-pavãozinho, Violence Copacabana. Bookmark the permalink. 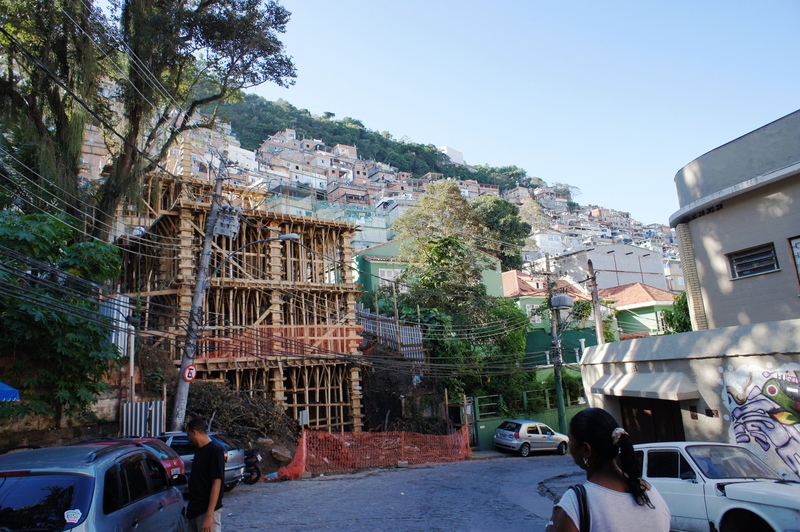 1 Response to Violence in Copacabana: where will it take us? Reblogged this on Latin America Watch.